What is the Real Time Call View? The Real-Time Call View is a live view of all your currently active call-backs, and queued call-backs through the Fonolo system. To access the Real-Time Call View, go to Stats (1) > Real-Time (2). 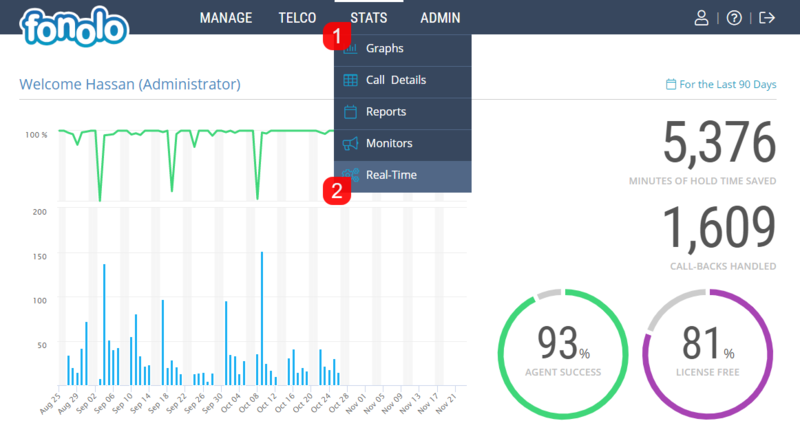 The Real-Time Call View is able to display data from different Call-Back Profiles. To change which Call-Back Profiles are being reflected in the Real-Time view, click the blue link (1) (shown below), in the top right corner of the page, check the boxes beside the preferred profiles, and click the green ‘Save’ Button. The data should automatically update at this point. Calls displayed on this page are separated into three different sections Active Call-Backs, Pending Call-Backs and Scheduled Call-Backs. Clicking the Active Call-Backs tab (2) will bring up a list of the currently active Call-Backs for the selected Call-Back Profiles (1) (shown below). Any call-backs that are currently on hold in the queue, currently being placed to the Client, or where the Client and Agent are already speaking will be under this section (3). You will be able to see the Date Started for each call-back, as well as a live view of the Duration so far for each call-back. Under the Destination column, you can see the Target that the call-back is being placed back in to. The Client is the number that the Client has wished to receive their call-back on. The Status will display whether the call-back is currently on Hold within the queue, or if the call to the Client is already in progress. You also have the option to Cancel, or Retry a call-back by clicking the links on the right hand side of the table in the controls column (4). Cancelling a call-back will remove it from the Fonolo Portal completely. Retrying a call-back will remove the current call-back from the queue, and place a new one back into the queue while following the Rescheduling options that have been configured for that Call-Back Profile. The Pending Call-Backs can be exported as a .csv file by clicking on the “Export Call-Backs” link on the right of the page (4). this will automatically download the file to the default browser download folder. Alternatively, you may export the call-backs file, while simultaneously cancelling the call-backs by clicking “Export and Cancel Call-Backs (5). Clicking the Scheduled Call-Backs tab (2) (shown below) will bring up a list of call-backs that are scheduled by the client to start at a future date/time. The Call-Backs that are displayed (3) are dependent on the selected Call-Back Profile (1). The “Date Added” column shows the date and time when the scheduled call-back request was added. “Date to Start” shows when the call-back is scheduled to start.